You can now watch the webinars and read the notes. 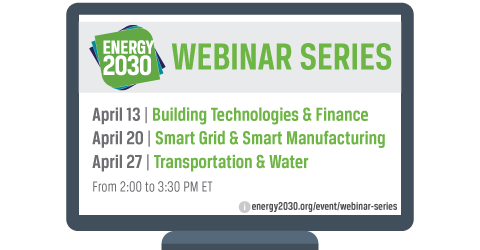 The Accelerate Energy Productivity 2030 Partners hosted a webinar series that examines industry transformations and policy strategies in the context of energy productivity, which informed DOE for the draft of its second installment of the Quadrennial Energy Review (QER 1.2). Buildings account for roughly 40% of U.S. energy consumption. To double energy productivity, it is critical to increase the implementation of innovative, energy efficient technologies and the associated financing mechanisms that drive their deployment. The United States could potentially save an estimated 5.4 quads per year. Speakers will touch on the existing and next-generation technologies and the financing mechanisms that can ensure their widespread penetration. Access the presentation in PDF. With the increasing availability of technologies and data to inform energy usage and dispatch, the U.S. electric system is at a strategic inflection point. We must carefully plan and invest, and deploy technologies that will ensure safe, reliable, and affordable power. We must also look to bolster our manufacturing sector so that these major energy consumers can increase energy productivity in their own operations through smart manufacturing processes that deliver a competitive advantage. Speakers will offer insights and policy recommendations for both topics. Increasing the energy productivity of moving goods and people will require deploying new technologies that increase vehicle efficiency, electric vehicle penetration and infrastructure, and options for mass transit; and better integrate transportation needs into land use planning to reduce vehicle miles traveled. Equally as important is the need to better understand and integrate the interconnected nature of water and energy systems. Speakers will address existing and new policy strategies that can help increase energy productivity in both key sectors.